Not too long ago, our family embarked on a monumental road trip, covering more than 10,000 miles in a Pontiac Vibe over the course of two and a half months. We stayed in campgrounds every night. We never made reservations. We cooked all our meals over a fire or a little camp stove. We had a blast! For some reason I’ve never written about our very favorite campground destination. Maybe I wanted to keep it for myself for a while before I shared it with all of you. But the time has come, and the magical place I want to share with you is Cathedral Gorge State Park in Southwestern Nevada. This is the view from the park road heading to the campground. We discovered this illustrious valley quite by accident. The sun was setting, and we had yet to decide on a place to sleep. We passed a very nondescript sign for Cathedral Gorge State Park, and decided to give it a go. As we drove down the narrow, winding road toward the park, we felt like we were entering another world entirely. Spires of soft, bentonite clay rose out of the desert, and seemed to go on for miles and miles. Surrounding the gorge was a land of sprawling sagebrush, and in the middle of that – a tiny oasis of activity. Otherwise known as the campground. With just 22 campsites scattered among the park’s only stand of trees, I thought we would be pretty lucky to find a site, but it turned out that the place was pretty empty, except of course, for the birds and jackrabbits. 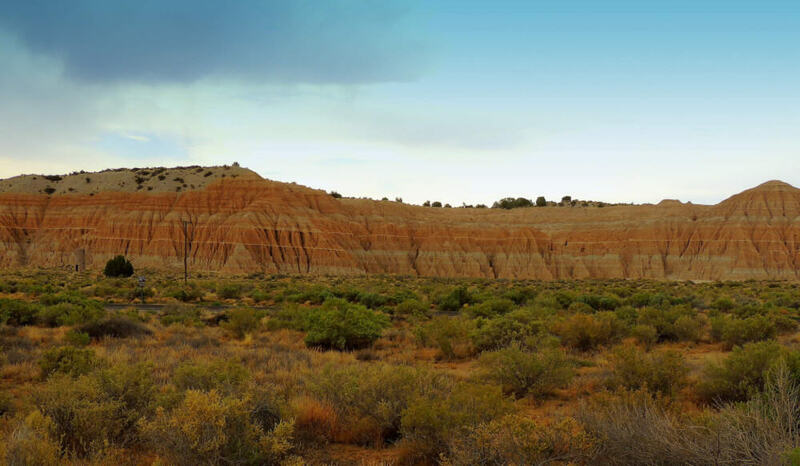 The birds were singing and flitting around from the moment we arrived, and we learned later that the little campground in Cathedral Gorge State Park is a mecca for desert birdwatchers. I love birds, but I can scarcely tell a sparrow from a warbler. The songs those birds sang to us that evening, though, were an absolute treat. The jackrabbits were everywhere, and unlike our little cottontail rabbits back east, these guys and gals weren’t at all skittish. They loved watching us and would bounce a few steps away when startled. The campground at Cathedral Gorge is beautiful, with lush plantings, shaded pavilions, and private campsites. From the campground, trails snake through the desert and sagebrush toward the gorge, where we’ll take you in a minute. 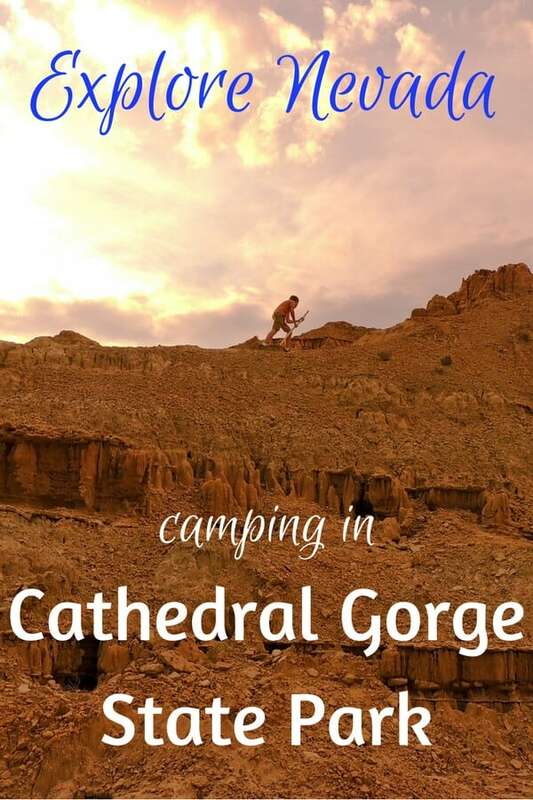 First a few tips about camping at Cathedral Gorge State Park. The park and campground are open year-round. Electrical hook-ups are available for an extra fee. The bath house is really clean and has hot showers. Sites are not reservable. 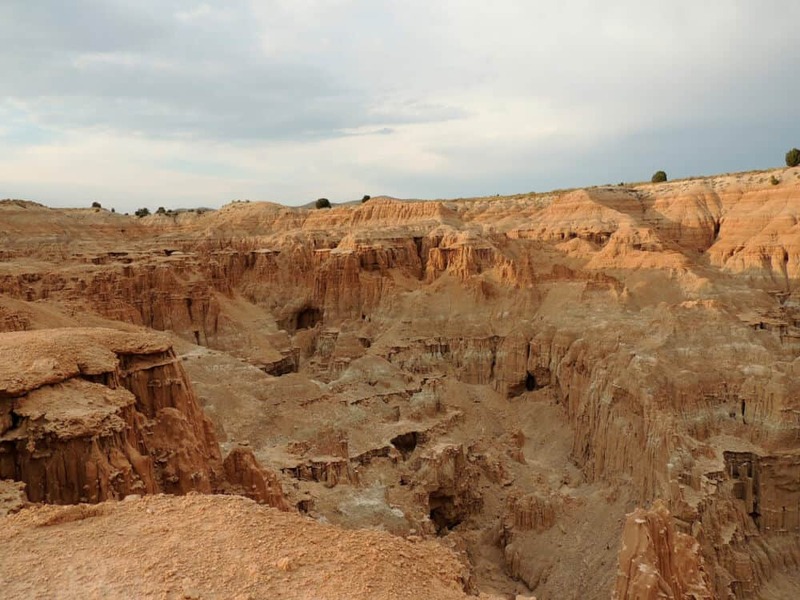 We visited Cathedral Gorge in the summer, and three of the 22 sites were being used. Perhaps the winter is more crowded. You can camp here for up to 14 days at a time. Sign me up!! There are two handicapped-accessible sites and a large group area. The night sky is one of the most outstanding features of Cathedral Gorge State Park. It’s incomparable, especially for someone from the east coast of America. It gets really hot. I guess this should go without saying, but like most of the state, Cathedral Gorge State Park gets really hot in the summer. My advice – spend your evenings hiking, your nights paying homage to the universe, and your days chillin’ out in your tent. The caves were so much fun to explore, I almost forgot to take pictures. 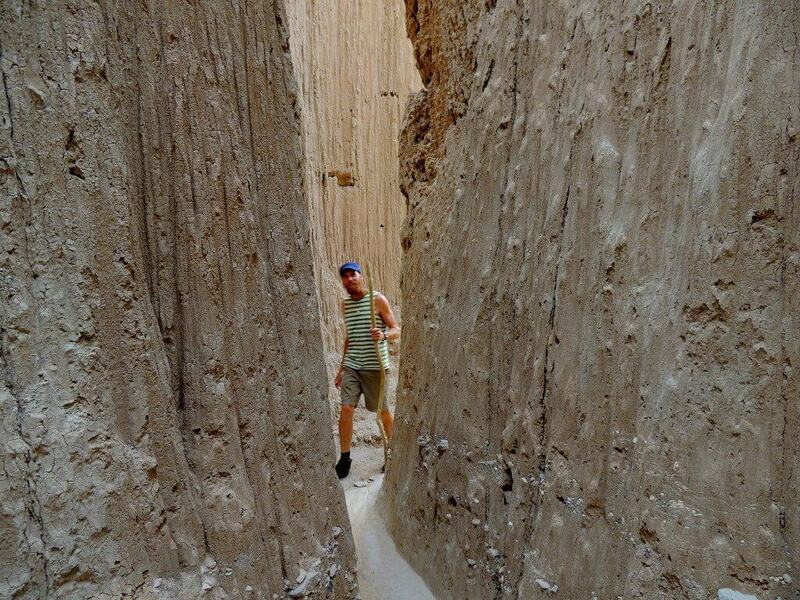 Cathedral Gorge is a short hike from the campground. You’ll pass through low-growing plant communities which consist of white sage, four-winged saltbush, barberry sagebrush, and greasewood, plus a few others that I couldn’t identify. Because the ecosystem here is quite fragile, there are signs asking you to stay on the trail. 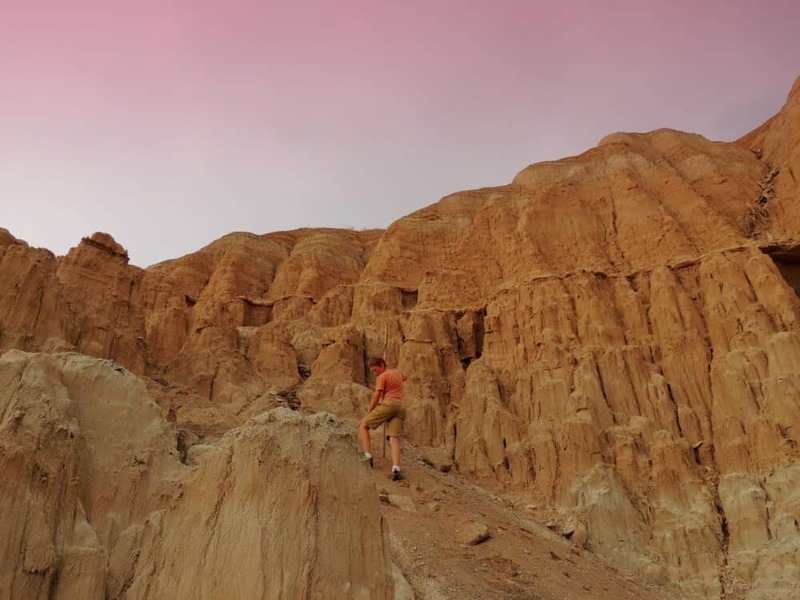 Cathedral Gorge consists of incredible spires of bentonite clay reaching toward the heavens, and creating cave-like formations that just beg to be explored. It’s like an elaborate labyrinth – perfect for games of hide-and-seek. Looks like we weren’t the only ones smitten with the allure of the towering cathedrals. 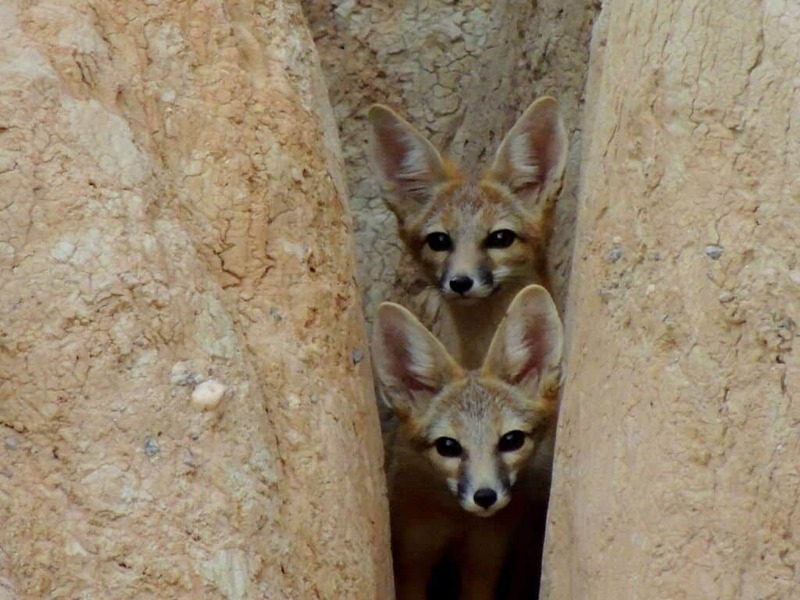 We found this litter of kit foxes playing inside the labyrinth. They weren’t a bit startled by our presence – in fact they were incredibly curious about us. After exploring the gorge a bit, you can hike a four-mile loop trail that starts at the campground and circles through the desert, around the gorge, and out to a spectacular overlook. This is a great early morning or evening hike, especially if you’re hoping to catch glimpses of the abundant wildlife. A sunset hike makes everything better. Seriously, friends, our weekend at Cathedral Gorge State Park was one of the highlights of our humongous road trip. It’s a small park and really quiet, but perfect for a weekend getaway, and just as lovely if you’re only passing through. 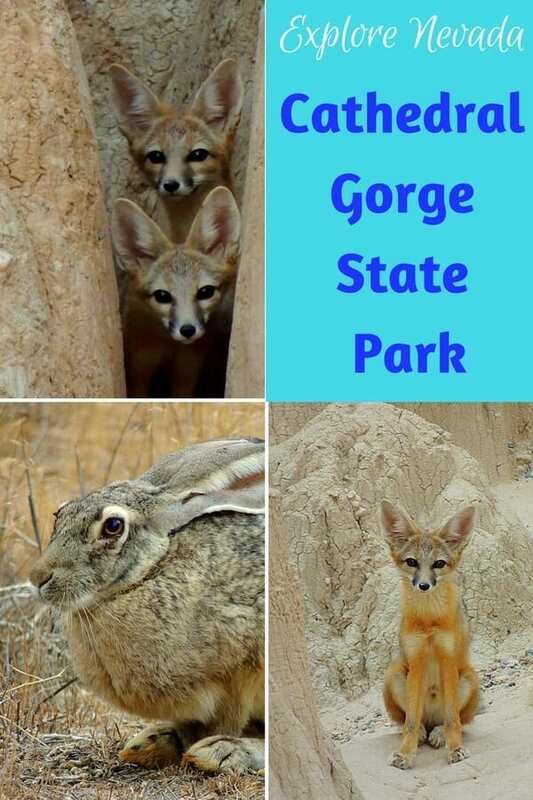 Make Cathedral Gorge State Park a priority on your next road trip, and say hello to our friends the jackrabbits. Tara, what a wonderful write-up about our park! It was lovely for you to share with others. 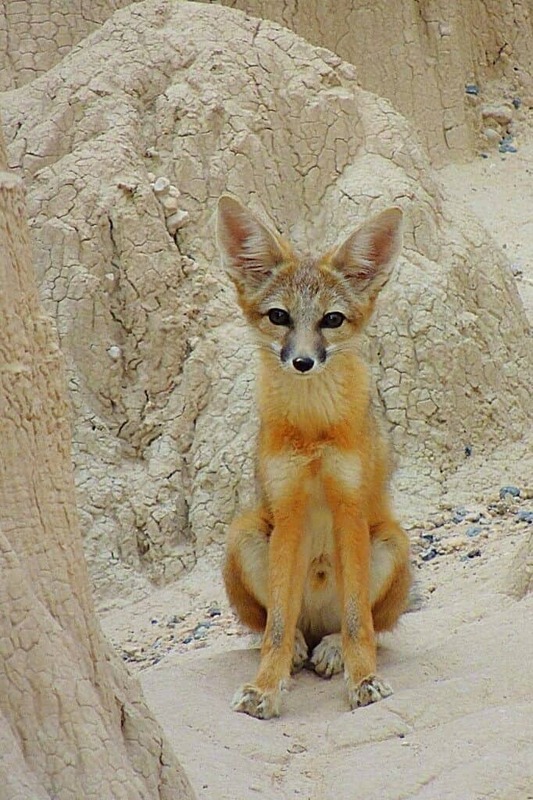 I love the photos of kit fox family. They were fun to have around; so playful and curious. I am so glad you enjoyed it here. We really want our visitors to have a great experience and it looks like you did! Everyone come and visit. It is worth the trip. I love the kit foxes. Their faces!! What a great place to hike and be with nature!!! Love. Amazing place to explore with family and friends. 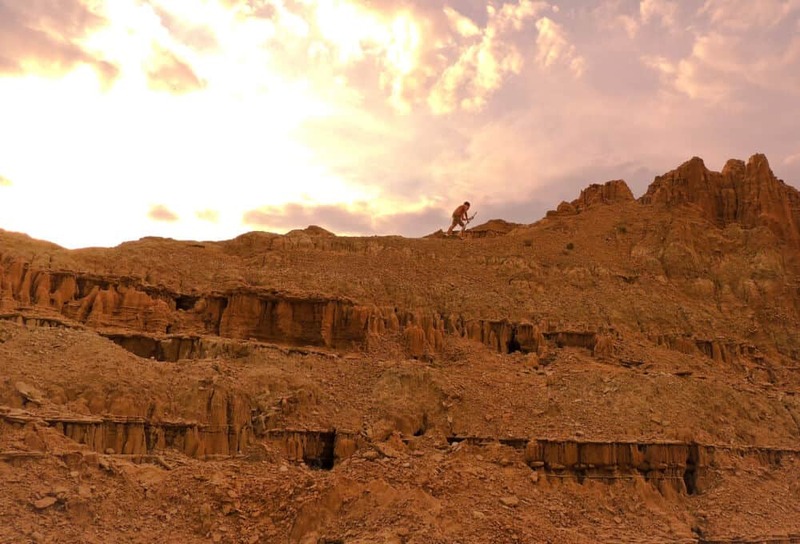 Pictures of foxes and sunset hiking are beautiful. Rabbits and foxes and big red rocks? Be still, my heart. This is definitely going on my list for when I start exploring the States. 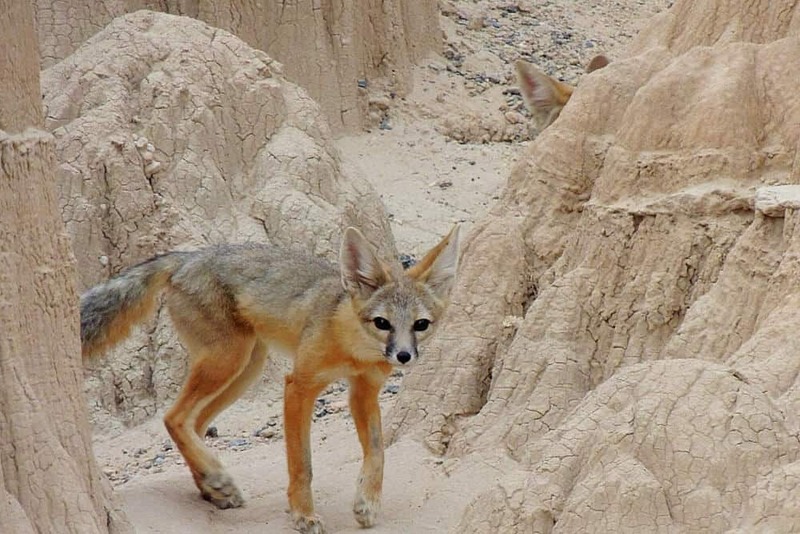 This looks like such a gorgeous place, those kit foxes are adorable! I used to go up to Nevada every year to visit my grandma, but I’ve never actually traveled around the state very much. I’ll be hitting the road this summer for a US road trip (in a Pontiac Vibe as well! ), so I’ll definitely be adding this spot to my list as a stopover. Hurray for road trips! We loved traveling in our Vibe – and we had four people in ours for more than two months. What an incredible location! I hadn’t heard of Cathedral Gorge State Park before. Now you have my interest piqued. I’ll need to look at a map and see how far it is from where I live (Sacramento, CA) as I always love discovering new places to visit. Thanks so much for sharing your adventures of photos. 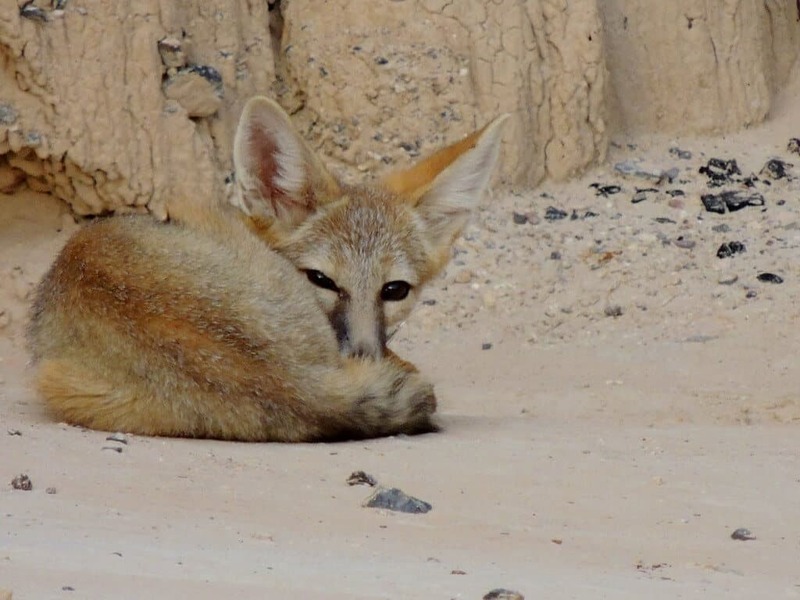 Wow – such beautiful pictures and look at those foxes! And the caves look very very interesting and beautiful ….although I am a bit claustrophobic – I might be a bit scared to go through the caves! But this looks like a beautiful adventure and you gave such helpful tips! Love all the pictures of your trip, especially the ones of the fox…how awesome was that!!! I’m always looking for new places to explore..thanks for sharing! That’s funny about the Vibe. We love it too. It gets awesome gas mileage, which means we have more money to spend on traveling! Wow, what great pictures!! I’ve visited Nevada a couple of times (Grand Canyon area, as well as Tahoe) but haven’t been to Cathedral Gorge… maybe someday! Looks like fun! What a wonderful trip that must have been and your photographs are just beautiful! Road trips are so much fun, this looks like a destination for my family and I to consider. OH MY GOODNESS! How cute are those foxes?? Your pictures are amazing! I go camping a lot, and live in Arizona. I’m definitely going to need to check this park out! That sounds absolutely amazing! We are a family that LOVES camping and I am excited to check this place out. Thanks for sharing this gorgeous site. Your pix are amazing! I have to go there, your experience at that campsite was so interesting! Those little foxes are too precious! What a cool experience! 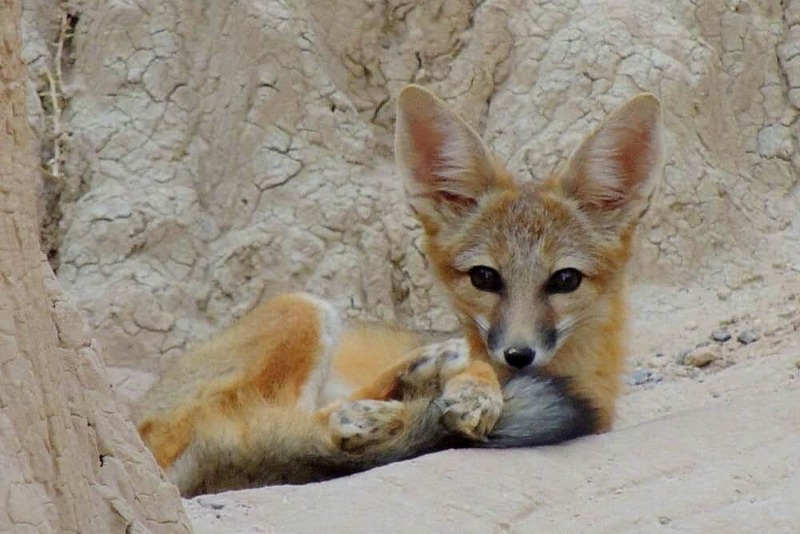 Those foxes are so cute and you got some really great captures. Thanks for stopping in, Ruth. These photos are just amazing,and I thought I lived in a Beautiful place here in Arizona!….wish I was somewhat younger, i would like to put this place on my bucket list! Nice seeing you here, Pop Pop. It’s probably not too far from you! Wow! Your post is very fantastic! The sun set hiking photos are very cool. Thanks for sharing. Thanks, Minoru. I was admiring all the flowers on your post! Thanks for stopping in, Becky. I love that we can share the beauty of the places we love with each other. New Zealand seems to me like the most photogenic place on earth! I love these photos! 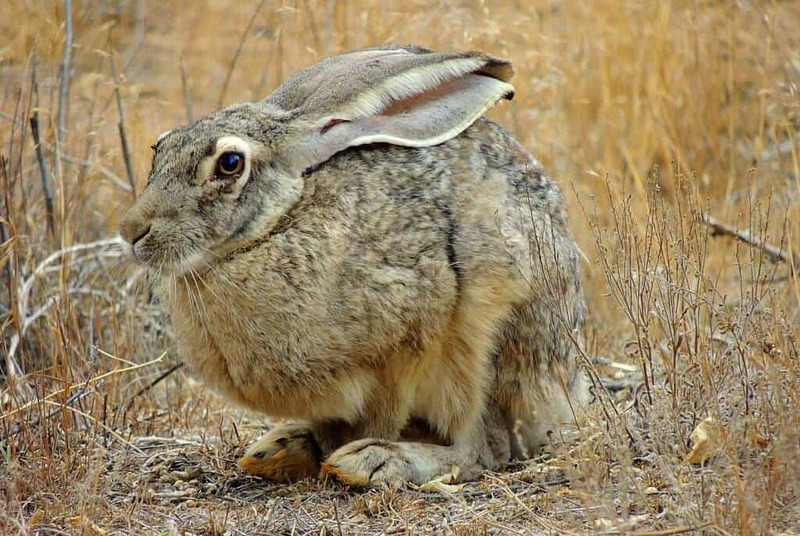 Great captures of the jack rabbit and the kits! So precious! I lived in Reno for a really long time (12 years), but I wasn’t such an outdoors person back in those days…actually I was; my SO was not. I’ve explored the Lake Tahoe area pretty extensively but beyond that, I didn’t have a chance to get out much. Thank you for sharing these with us at Photo Friday! I didn’t start exploring the outdoors until I was in my early 20s, which means I missed all of that beauty in the south east. Someday I’ll get back there and see what I’ve been missing.